Online Poker – What is The Status of Affiliates in Regulated Online Poker? Online poker affiliates were a major factor in the online poker boom on the 2000’s. Affiliate marketing referred hundreds of thousands of players to poker sites last decade. Many of these portals operated by these marketers created content that poker players looked for in search engines. Many created communities with active poker forums. Large affiliates negotiated great deals with poker sites in exchange for a prominent position on busy websites. This included freerolls, larger bonuses, rake races, a better clear rate on bonuses, and free bankrolls that help get beginning players into the game. It was a system that benefitted both the poker sites and the affiliates. Not all affiliates operated legitimately. Some built businesses based on breaking the rules of poker sites. Others never delivered on promises. These affiliates gave the entire online poker marketing industry a bad name. The affiliates that were the biggest problem in the unregulated online poker world were those that did not try to bring new players into the system. Instead, those affiliates approached and lured players that were already active on one site or skin and tried to encourage them to move their activities to another online poker room. This was often done by breaking rules on maximum levels of rakeback or paying cash to players under the table. Some skins on poker networks condoned this behavior and made it easier on affiliates to break the rules. Some rogue affiliates made offers that were too good to be true. These scam artists would promise excessive rakeback returns in exchange for action. The fraud was often obvious, but greedy players would fall for it. Some deals involved sites where rakeback was forbidden and player stats not provided, making it impossible to fulfill the offer. The promise of higher rakeback attracted some high volume players that fell for it. The affiliates would vanish with all of the promised rakeback and often reappear under a different name, months later. There were also sleazy affiliates that would simply steal content from competing sites. This would include reviews, blog posts, and videos. Today’s regulated affiliate model puts an end to all of these sketchy business practices. Affiliate models in Nevada and New Jersey require licensing. Any affiliate business in New Jersey requires a license issued by the New Jersey Division of Gaming Enforcement for receiving a flat rate per player, known as CPA. Revenue share deals require additional background and licensing. Nevada affiliates require full licensing for revenue share affiliates. Those looking to get CPA do not have any regulatory requirements. There are still legal requirements affiliates must adhere to when marketing to players under a CPA deal. Delaware took a completely different route. Gaming is run by the state lottery. There are no affiliate deals, which may be a reason for its poor performance. The licensing requirement has created some problems in the legal gaming industry in Nevada and New Jersey. Only two affiliates applied for and received a gaming license in Nevada. PokerAtlas is one. The other is Churchill Downs, which owned Bluff Magazine until it folded in 2015. The Nevada online poker market is not large enough to justify the return on investment required to go through the licensing process. Nevada’s lone poker site is WSOP.com. It offers CPA deals to any legitimate affiliate, making the revenue share license even less attractive. The defunct Ultimate Poker site did not have an affiliate program. This was a contributing factor in its demise. Real Gaming, which briefly entered the market but eventually failed, also did not have an affiliate program. New Jersey has taken a strict approach towards affiliates. In 2015, New Jersey Division of Gaming Enforcement Chairman David Rebuck issued a memorandum demanding that affiliates licensed in the state cease marketing offshore sites. 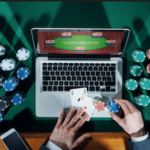 This put online poker affiliates in a position to decide between marketing online poker to two regulated sites in a single state or choose to market offshore sites to all players. This forced some affiliates to leave the New Jersey market, lowering its exposure to potential customers. Affiliates have far less influence in the U.S. regulated market than they do in the offshore one. The approach to licensing affiliates and a lack of performance of legal sites contribute to this problem. The situation should improve drastically as more states get online and networks cross state lines. With a few exceptions, online poker affiliates are nearly irrelevant in today’s legal intrastate online poker markets. If you’d like to learn more about affiliate marketing in online poker, we suggest you read our related blog post: “Role of Affiliates Declining in Modern Online Poker”.